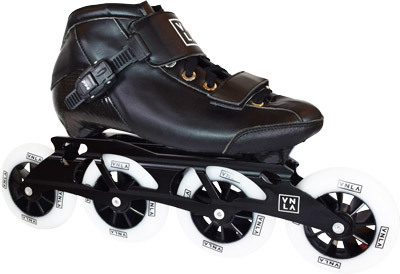 Most sizes of the Vanilla X1 inline speed skate are now in stock. This is one that Vanilla has been talking about for quite some time now, and it is finally here. This is an entry level speed skate, priced slightly less than the Carbon. Sizes 1-5 have a three wheel frame with 100mm wheels and sizes 6-13 have a four wheel frame with 100mm wheels. The boots and frames are black, the wheels are white. The bearings are Reaction ABEC9. Adult sizes are in stock now. Sizes 5 and smaller are coming soon (they originally sent in the wrong frames on small sizes).